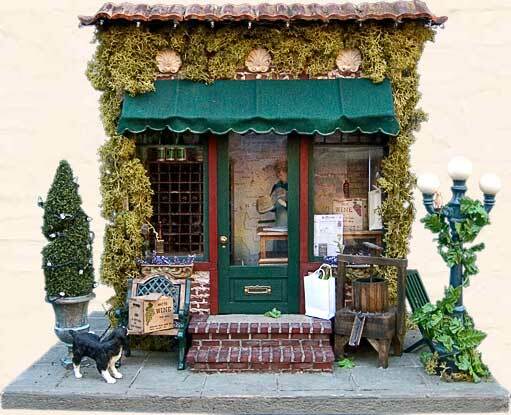 16.25" x 11.75" x 13"
This building was created to teach a class on how to "distress" for Shellie’s Miniature Mania in San Carlos, CA. Using English brick wallpaper and wall & board joint compound, Suze used a toothpick to put the compound between the bricks in order to give the shop an "old world" look. Monsieur Merlot sells vintage wines in part because of their smoothness, and partially because he himself is a vintage miniature.